Maybe not the best title, but that is all I could find. 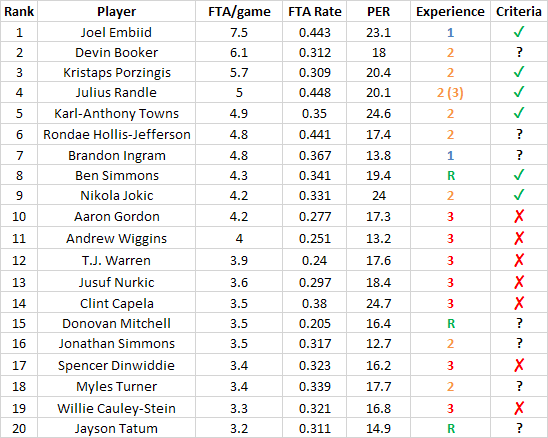 I have researched on the first 4 years of current as well as past young sensations, and tried to find out a pattern to categorize them into "Allstar/Superstar" level potential, and how soon they reached them if they were that good. I will first say this. My criteria is in no way objective, as I cannot verify it without a large amount of data. But when I listed a group of players, I was able to find a large correlation. In first 4 years (rookie contract), reach all the categories at once within 5% tolerance. First of all, I will list some of the notable players and when they were able to "break out" on to the next level. And the following list is the players that rank in Top 20 on FTA/game in 2017/18 season. FTA/game, FTA Rate and PER are listed, as well as their experience in the league and if they satisfy the criteria or not. You will find that next to some of the players there is a ✔, and next to some there is ✘. They represent whether they were able to satisfy the criteria within alloted time (i.e. first 4 years). And on some of them there is a question mark, which indicates that player is yet to satisfy the criteria but he has time to do it. This kind of approach might be useful to assess the young talent, as well as what could their next contract be? I'm a big proponent of using stats as a predictive tool, but it's important to know its limitations as well. In terms of predicting the future of young players i think its important to keep in mind what type of talent they are coming in to the league. Take Ingram and Simmons for instance. Ingram was nearly a year younger than Simmons and much less physically developed, so it is completely expected that he'll take longer to develop. But based on his work ethic, raw tools, talent and lack of weaknesses i think he has a good chance to be better than Simmons a couple of years down the road when you consider that Simmons has some flaws that can be difficult to correct (being a non-shooter). Also, there is a big difference positionally in terms of how a player will develop. Well, I respect your opinion and understand where you are coming from. But the purpose wasn't really to rank the players, rather it draws an outline for who makes to the next level and who doesn't. Arguably Simmons and Embiid already made it to next level. (Simmons and Embiid actually are more developed than regular rookie and sophomore players as they missed their one year and two years respectively. They are similar to Griffin) They are not perfect but as I said it doesn't measure that. Ingram as he is right now is not there yet. But I'm hopeful he will be there in his 3rd year in the league. His trajectory is already predicting it. No idea Booker goes to the line 6 times a game.